Impressive, edgy—and yes, Instagram-worthy—here are the highlights of the sprawling, multipurpose campus opening in Manhattan today. Designed as a city within a city, the $25 billion Hudson Yards project, which opens today on Manhattan’s far west side, is a colossal architectural and technological achievement. Built entirely from scratch atop an active rail yard, the experiment in large-scale urban planning is punctuated by multiple venues that dazzle and delight—including the Elkus Manfredi Architects-designed Shops & Restaurants. While big-box stores like Uniqlo and Sephora may be found here, Hudson Yards as a whole is chock-full of modern design statements that beckon to be touched and experienced (and Instagrammed, natch). The best part? They’re all open to the public. There’s a ton to see and do at the Hudson Yards—below, we distill the development down to what we’re most excited about. Snark Park by Snarkitecture debuts with the art installation "Lost and Found," a forest of white columns distorted by shape and materials. 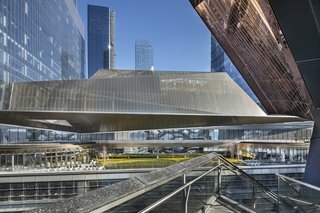 To distinguish itself from other malls, The Shops & Restaurants at Hudson Yards offers a unique prospect for shoppers called "The Floor of Discovery." Spread out across the entire second floor, the spaces are dedicated to digitally native brands, experiential shopping, and food and beverage concepts. Among the highlights are Snark Park, a permanent exhibition space from Snarkitecture that will feature a tri-annually rotating schedule of playful and immersive design environments (not to mention a Kith Treats ice cream shop), and Batch, the San Francisco–based home and lifestyle collective that offers curated, up-and-coming products and innovative brands perfect for home furnishing (the launch collection is dubbed "Batch Hello"). San Francisco–based Batch creates shoppable living spaces to bridge design and retail. "It’s such a great synergy because we do a lot of [shoppable] home staging and so being able to be part of the development that has all this residential attached is a really great opportunity," says Lindsay Meyer, Batch cofounder and CEO. "Bringing things we know our audience in California love to be exposed to the New York market, in a stylish and welcoming home environment, is exciting." Adds Daniel Arsham, a principal of Snarkitecture, along with Alex Mustonen and Benjamin Porto, "In many locations we’ve been installed inside of another space, and we couldn't control the space in its entirety. Here, from the merchandise down to even the experience of waiting in line, we were able to curate it all and build it from the ground-up. We created the ultimate controlled experience." Decked out in a millennial-magnet shade of pink, Forty Five Ten woos younger shoppers. Encompassing 16,000 square feet across four separate retail spaces on the fifth floor of The Shops & Restaurants, Dallas–based luxury boutique Forty Five Ten’s Manhattan debut echoes the retailer’s penchant for unusual design. Snarkitecture created the artful storefronts in collaboration with Forty Five Ten president and creative director Kristen Cole and Headington Companies, which includes an asymmetrical glass brick facade and grid-like retail displays within the stores. 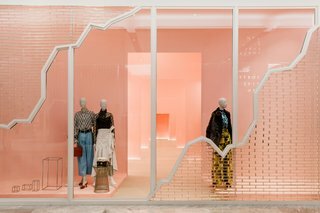 The women’s store is highlighted by a pink-painted area evocative of an optical illusion of consecutive shops that, while purposefully disorienting, is Instagram heaven. Custom Calico wallpapers enhance the walls in the 4510/Six and vintage boutiques, while the latter also features multiple marmoreal surfaces. Heatherwick Studio's Vessel is part sculpture, part public park. Boasting nearly one mile of vertical climb, the interactive sculpture known as the Vessel is the Big Apple’s newest social media attraction. 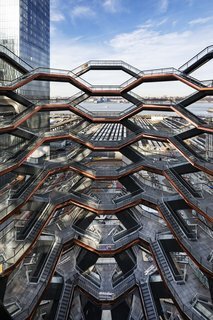 Imagined by Thomas Heatherwick and Heatherwick Studio as a focal point of the Hudson Yards complex, the non-corrosive structure is comprised of 154 interconnecting flights of stairs—almost 2,500 individual steps and 80 landings—that overlook the Public Square and Gardens. Expanding outwards, the Vessel is, quite simply, the inversion of all the buildings surrounding it. So soaring is this new landmark (open to the public via free, timed-entry tickets) that it’s already being called New York’s Eiffel Tower. The 4,000-ton outer shell of the Shed glides along rails to retract telescopically on six-foot-tall wheels. 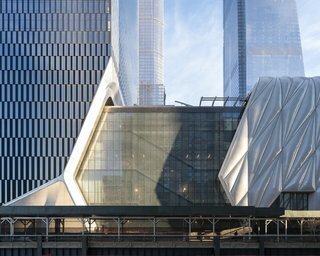 With the luxury 15 Hudson Yards condominium high-rise cantilevered over it, the Shed is certainly transformative—both literally and figuratively. Inspired by the adjacent High Line and designed by Diller Scofidio + Renfro to be reminiscent of a train car, the 200,000-square-foot space is an all-encompassing performing arts center. Recently named in honor of former New York mayor Michael Bloomberg, its remarkable design features a 4,000-ton outer shell that glides along rails to retract telescopically on six-foot-tall wheels, morphing the space into an open plaza. 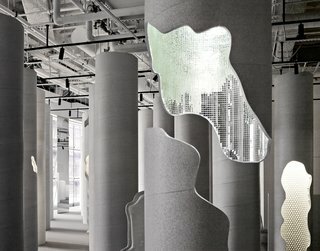 The layout of the eight-level space is entirely flexible and mobile, encased in Teflon-based polymer "pillows," cross-hatched with steel, that, from afar, look almost soft enough to hug. The Edge is poised to be the Western Hemisphere's tallest outdoor observation deck. 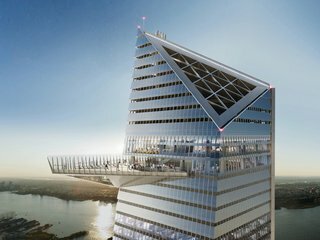 Due to open sometime in 2020, the Edge, hovering 1,100 feet above the ground, will be the tallest outdoor observation deck in the Western Hemisphere and the fifth highest in the world (it will just beat out the Empire State Building’s observation deck, in fact). Extending 65 feet out from the 100th floor of 30 Hudson Yards as it pierces the sky, the Edge will certainly be both an exceptional—and exhilarating—experience for visitors. "Edge offers a new perspective on New York from a vantage point that has never existed before," says Jason Horkin, executive director of Hudson Yards Experiences. "You become completely absorbed in the vastness of our iconic skyline." Learn more about the Hudson Yards.